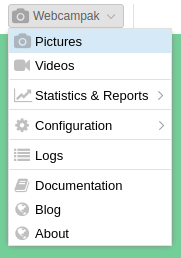 Captured pictures can be accessed by clicking on "Webcampak > Pictures" in the top-left menu. The Pictures window allows users to navigate through sources and their archives. 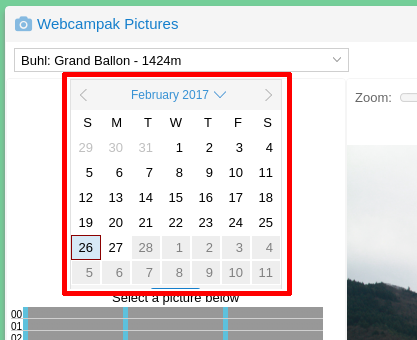 When selecting a source, Webcampak will automatically position the system to the latest captured picture. Clicking on the main picture will open directly open this pictures in a new tab. Using a calendar, users can navigate through the archives, clicking on days containing pictures. The system automatically detects available days and will gray-out days with no pictures available. The current day is automatically highlighted. 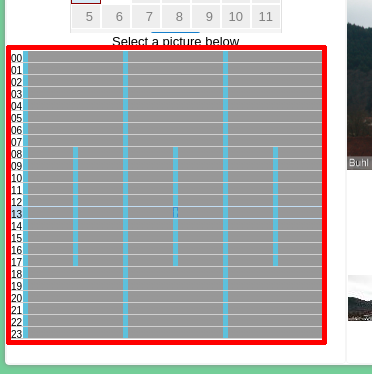 All pictures captured during the day are presented in a small widget, containing one row per hour (from 00 to 23) and one column per minute (from 00 to 59). Blue cells represent timestamps with available pictures. Mousing over a specific cell will display the picture's time, clicking on the cell will open the selected picture. Refresh the list of pictures available for the source. Users can also zoom into a picture by selecting the zoom level they would like to achieve (from 0% to 200%). 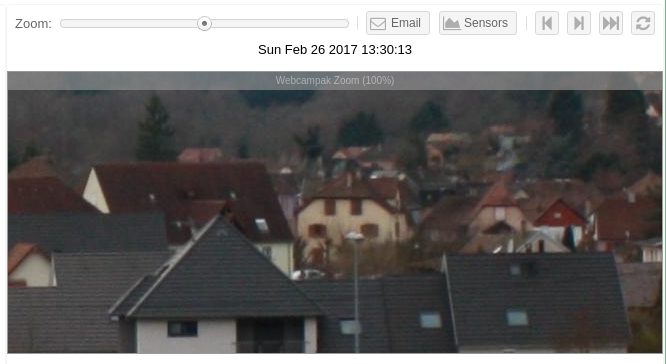 Once the zoom level is selected, moving the mouse in the window will focus on the selected area at the selected zoom level. 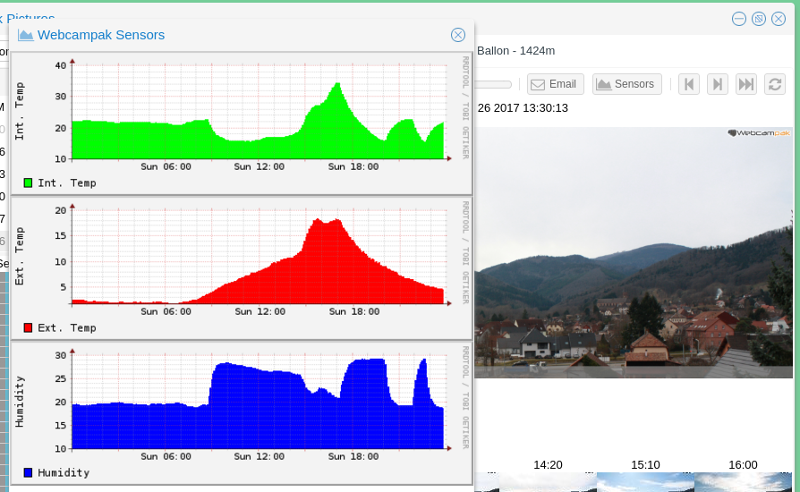 Users can also click on "Sensors" to view Phidgets sensors values captured by the system for that day. 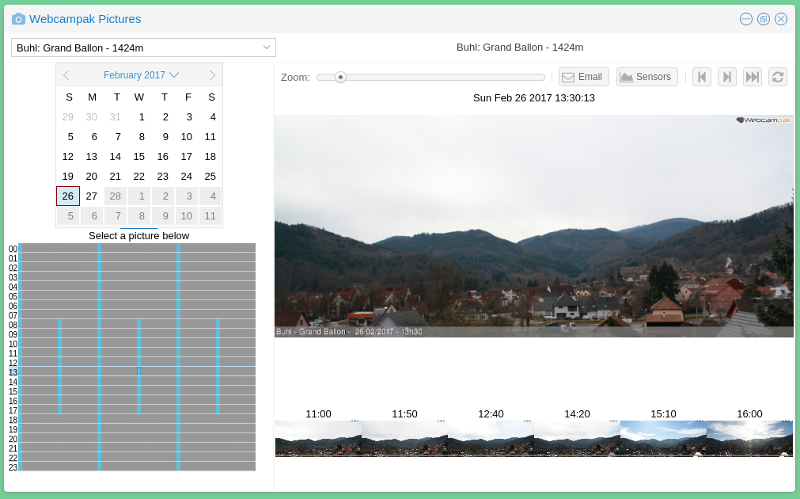 It will open a window displaying up to 4 sensors graphs. 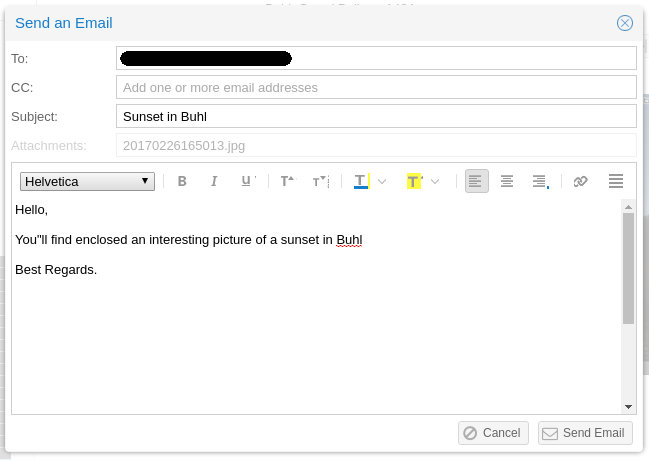 Users can send the current picture by email, by clicking on "Email". All parameters of the email can be customised, it is then placed into a queue and sent, usually, within a minute. 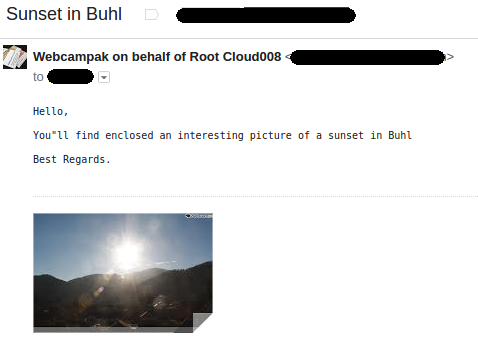 Although this email is sent by webcampak, the name of the sender is detailed in the "FROM" field to facilitates its identification and try to prevent spam.